Now is the time to take your work lifestyle a step further with the Danner Men's 63100 USA-Made Insulated Brown Waterproof Sierra Hunting Work Boots. Make sure you can keep up with your friends because these insulated shoes feature stitchdown soles, which has ... (see full details) (see specifications) #DNN63100. Now is the time to take your work lifestyle a step further with the Danner Men's 63100 USA-Made Insulated Brown Waterproof Sierra Hunting Work Boots. Make sure you can keep up with your friends because these insulated shoes feature stitchdown soles, which has always been considered the ultimate in boot construction. Stitchdown construction seals this brown footwear against mud, soil, and water, and it also maximizes flexibility. The Vibram 1276 outsoles are slip-and-oil-resistant to help you keep your balance. Vibram is a rubber compound that is extremely resilient and durable, and it reduces shock with each step you take. Fiberglass shanks provide additional reinforcement to your hardworking arches. These premium shoes are manufactured with 1000 Cordura nylon uppers that will last for more than a couple of winters. Cordura nylon will keep your feet warm, is water-resistant, yet is strong to resist scuffs and abrasions from branches, rocks, and just about anything you might encounter in the woods. Also, the 200 grams insulation will warm your feet in weather down to -30° F. Keep in mind these brown boots are lined with 100% waterproof, breathable Gore-tex. Your feet will feel so comfortable and dry you won't have the excuse of your feet hurting or being cold to exit gracefully. 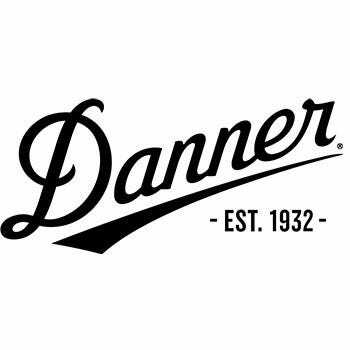 Come to think of it, maybe he's not a keeper, but you know your Danner Men's 63100 Brown Insulated Sierra Waterproof Boots are…they're made in the USA, so you can expect men's boots of the highest quality. Go ahead and order your pair from the Working Person's Store today. Danner makes exceptional boots. I have a few pairs of different models. These ones are great. You can tell just by looking how solid they are, but you really have to try em on to know for yourself. The vibram sole is outstanding. It looks kind of lunky but once it's under your feet, you feel really stable. The boot upper is sewn into the sole. THe upper is one piece, so these boots are TRULY waterproof, unlike some other brands. The eyelets are super tough. The only bad thing is the laces - I don't know why Danner makes such a great product with such weak laces. I replace mine with 550 paracord and it works great. I tell all my police and military friends to do themselves a favor and put part of their uniform allowance towards a pair of Danner boots. So happy to finally find a insulated boot that looks normal and not camo or with pink just because its girls.. They are my husbands Favorite pair. Good job guys big thumbs up! I have been waiting to find a pair that I know can last and will keep my feet dry and warm when I am doing work outside or we go hunting or hiking. thank you so much Danner! Your customer service people are great. I needed assistance with changing my coat size as well as the assurance that the order / delivery would still go smoothly. I'm sorry I forgot the names of two specific C.S. persons but they were wonderful and both had smiles! Keep up the good work, you are the face of the company!!! Danner Boots: Men's Brown 63100 USA-Made Insulated Waterproof Sierra Hunting Boots is being added to your cart.